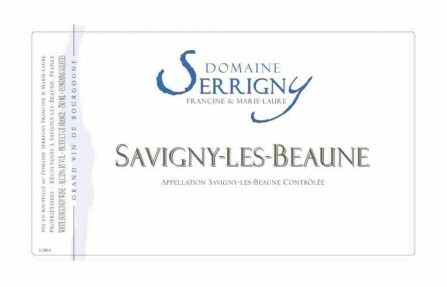 Domaine Serrigny is a family operation deep in the hollow of Savigny-les-Beaune. The household is on the hill behind the local château, and when you pull out of their road you can look down and see the seigneur’s crazy collection of mothballed fighter jets. He’s got them lined up on the chateau’s lawn, an eclectic display of man’s bird of prey. Domaine Serrigny dates from the late 19th century. It’s made up of 7 hectares of vines (17 acres) and is run today by Marie Laure Serrigny. She’s the fourth generation, and she took over the estate in 1995 with her younger sister Francine. They tended the vines, made the wine, and together did all the myriad of things involved in running a domain until late in 2016 when Francine succumbed to a long battle with cancer. Gilles Mathieu, a member of Jean-Pierre’s team over at Domaine Joseph Voillot, grew up in Savigny and had known the Serrignys all his life. He pretty much insisted that I visit, which I did early in February of 2016 without high expectations. The appellation is dominated by a handful of players and there was no press to speak of on the Serrigny wines. Francine met me in her little courtyard on a wet afternoon. She wore boots, jeans, an old fleece over a sweater, and she had a tired air of savoir faire. There was no pretense about this grower. Marie Laure, dressed much the same, made an appearance to say hello and left for more pressing matters. The office Francine took me to had the look of a room that had been well used a generation ago. A fax machine still sat in the corner, plugged in. She opened a 2014 Bourgogne Blanc, and from the first scent of orchard fruits and minerals and honey I was carried away. Gilles arrived as the second wine got opened, his bald pate gleaming from the rain and his magnificent, sweptback moustache flaring like wings from his cheeks. As night fell, Francine’s boyfriend Jean-Luc Rousseau came in from the vines. 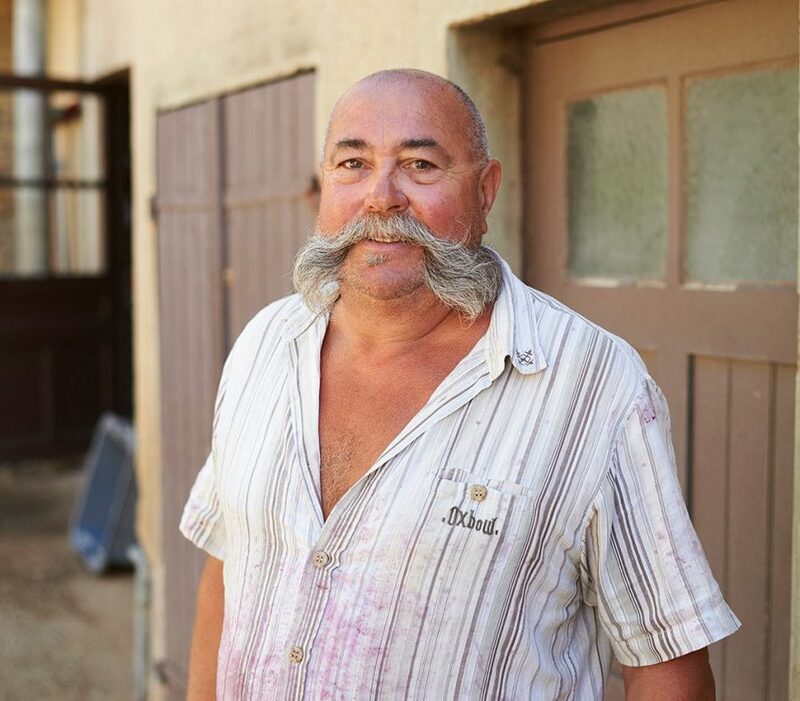 He worked for many years in the cellar at Vougeraie, but came over full time to Serrigny as cellar master in 2015. A reputed soccer goalie in his youth, he’s an enormous man with a great spread of arms, and he came into the dark room cold, wet, tired, and grateful for a glass. We sat around an old oak table in that modest office tasting what was an eye-opening range of old-vine wines from two vintages as the three friends caught up and warmly exchanged opinions on the wines. Among French growers, this was a common occurrence. For an American, it was a privilege. And not everything in Burgundy had been discovered, that was clear that evening, and that was pretty exciting. It was still possible to stumble upon two hardworking sisters who maintained a fax machine, did pigeage by foot, and made killer wines. 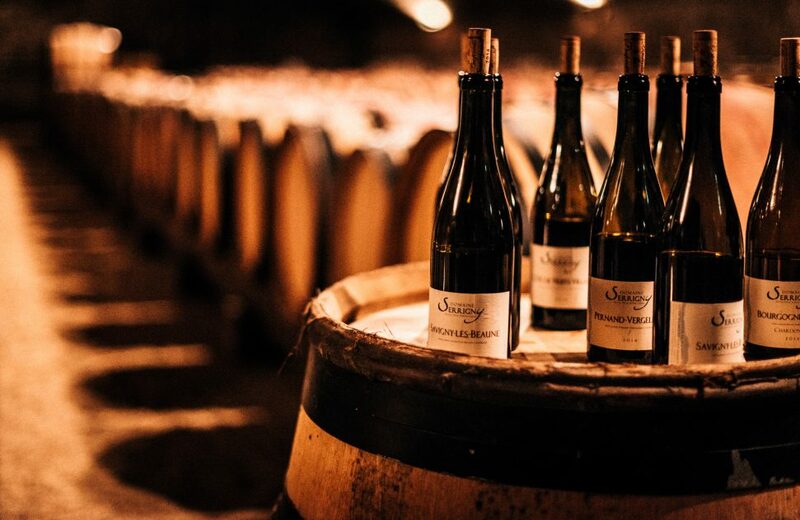 Domaine Serrigny farms small parcels in Auxey-Duresses, Côte de Nuits-Villages, Corton Charlemagne, Meursault, Monthelie, and Pernand Vergelesses, but the historic heart of the holdings are in Savigny. The farming culture is lutte raisonnée, i.e., sustainable, and the approach in the cellar is quite traditional. The parcel and the maturity dictate de-stemming entirely or partially or not at all (old man Serrigny apparently never de-stemmed); ferments are spontaneous and the reds undergo alcoholic fermentation in wooden uprights; the cap is still, remarkably, broken up by foot; and all of the élevages take place in older barrels for fourteen months (sometimes less for the whites, sometimes more for the reds) before racking to steel where the wine rests for several more months. No fining for the reds, and bottling with only a light filtration. Another salient fact is that Marie Laure works with some very old vines. These perforce give low yields, and it’s an exceptional vintage here that gives as much as 40 hectoliters per hectare. She’s not afraid to wait for good ripeness either. The result is a range of Pinots deliciously rich with earth, fruit and spice, and frequently, depending on how limey the limestone soil is in a given plot, quite mineral. They also have excellent acidities and tannic structures. Her Chardonnays are plump, toothsome renditions underpinned with driving acidity. These are wines made with a modest yet sure hand, which in all things wine is the most honest of hands. Average production is 2,500 cases. The hail of 2013 damaged 80% of the Serrigny vines. The frost of May 2016 wiped out roughly 70% of the domain’s crop. Any plans that Marie Laure might have had to buy an automated system of pigeage went out the window. Tradition, chez Serrigny, endures. Photo of Gilles Mathieu courtesy of Sébastien Erôme; the one of the bottles courtesy of Jeff Bramwell. Chardonnay A wine from two communes: an acre in Savigny-les-Beaune’s Les Perrières lieu-dit planted in 1991; and two acres in Meursault (in Herbeux and Malpoirier), where the vines average 40 years of age. These mature vines coupled with the pedigree of the terroirs make for a Bourgogne Blanc with intensity and substance, one punching well above its weight. Elevage takes place in older barrels for twelve months, followed by four in steel (essentially the same treatment used by the Bachelet boys at Bachelet-Monnot). Savigny-les-Beaune blanc Chardonnay Three parcels produce this wine: Les Connardises, Les Bas Liards, and Les Pimentiers, planted in 2010, 1989, and 2008 respectively and totaling just over an acre and a half. Elevage is the same as for the Bourgogne Blanc. Production averages 375 cases. 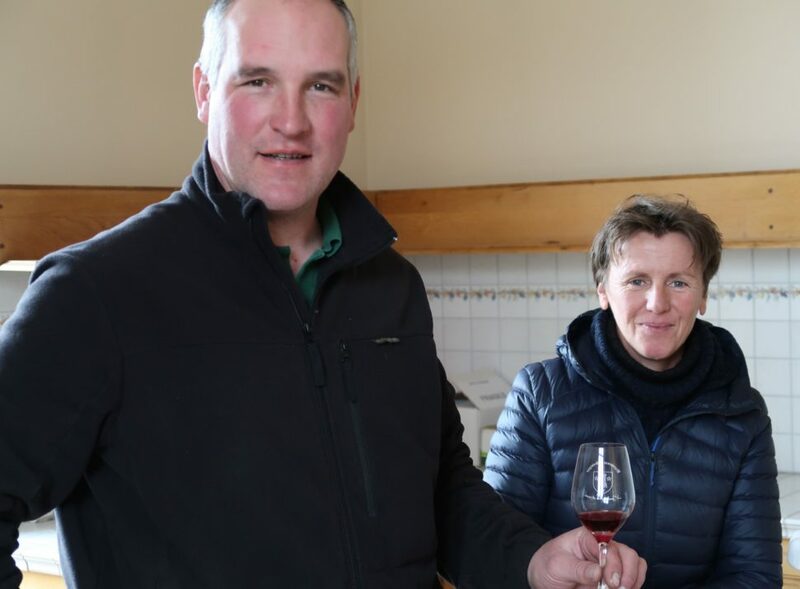 Pinot Noir Marie-Laure’s Savigny rouge comes from less than three acres spread among the parcels of Aux Champs Chardons, Aux Fourches, and Les Planchots. Production averages 500 cases. Pinot Noir Serrigny’s 1.3 acres of vines in Dominode, a subzone of the premier cru Jarrons, are now about 100 years old and grow adjacent to those of Bruno Clair. In riper years, about half the grapes are de-stemmed before fermentation. The soils here are sandy and make for a supple wine with exceptional finesse and length. The name probably comes from the Latin “Dominus,” owner, master, or lord, implying that back in the day this site belonged to the Lord of Savigny. Pinot Noir The domain has just over two acres of vines in Peuillets ("peu-yā", with a long 'ā') planted in 1965. Like the grapes from Dominode, in riper years only about half the grapes are de-stemmed prior to fermentation. The soil here is much more influenced by limestone and the wine is consequently more mineral and “lifted” in profile than the Dominode. Auxey-Duresses 1er cru En Bas des Duresses Pinot Noir Serrigny's parcel amounts to two-thirds of an acre, and it was planted in the 1960s. The domain first made wine from these vines in 2016, when it bought the parcel from Domaine Moulin Landin. Alcoholic fermentation was done entirely without stems both in 2016 and 2017. Savigny's terroir favors a profile of black fruit; Auxey gives red fruit. Normal production is 150 cases.